Baby-led weaning (often also referred to as BLW) is a method of gradually weaning a baby from a milk diet onto solid foods. It allows a baby to control his or her solid food intake by self-feeding from the very beginning of the weaning process. Infants are offered a range of foods to provide a balanced diet from around 6 months. They often begin by picking up and licking the food, before progressing to eating. Babies typically begin self feeding around 6 months, although some will reach for food as early as 5 months and some will wait until 7 or 8. The intention of this process is that it is tailored to suit each particular baby and their personal development. The 6 month guideline provided by the World Health Organisation is based on research indicating the internal digestive system matures over the period 4-6 months. It seems reasonable to posit that the gut matures in tandem with the baby’s external faculties to self feed. 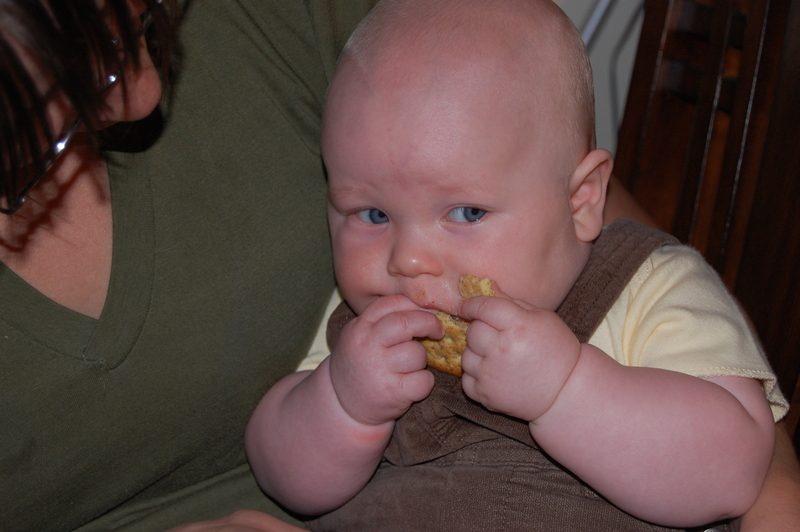 Initial self-feeding attempts often result in very little food ingested as the baby explores textures and tastes, but the baby will soon start to swallow and digest what is offered. Breastfeeding is continued in conjunction with weaning and milk is always offered before solids in the first 12 months. This is the route we’ve decided to take with Isaac. It’s not so much that I think the other methods have any fault, it’s just that well I’m lazy and we’re ‘homeless’ for pretty much the entire month of Dec so making purees and freezing them is pretty much out of the question. I know we could just use jars of food, but then you still need to worry about refridgeration after they are opened and that just isn’t always going to be feasible. Of course I’ll continue to breastfeed while we try this. We’ve already tried giving Isaac crackers, red pepper, bread, and pasta noodle. So far all he does is play with it, bring it to his mouth and smush it in his hands, but it keeps him entertained while we’re eating so we’re not complaining. Oh he is going to LOVE solids! Interesting approach, although I actually find the puree thing easier than trying to make a balanced meal for us grown-ups sometimes! love the photo, how cute!!!!! What a love. I just want to eat him up. I need my own baby weaning! I have heard of BLW although we didn’t try it ourselves. I had trouble figuring out what to feed Nate when we switched from purees to real solids, so I’ll be interested to read more about how it works for you guys. It think the theory is interesting and I would definitely consider it for a next babe!